« New revolutionary Poetry in Stock ! While the very north of Germany luckily has more or less been untroubled by the enduring wave of broad racist mobilisations so far, some well known neonazis and their friends plan a xenophobe march against refugees in Neumünster next week end. Please note that Neumünster is not only known for a long tradition of neofascist structures since years, but also the main go to for asylum seekers in Schleswig Holstein region. It’s clear that it’s up to us to nip these tendencies in the bud and kick the mental arsonists and racist shitheads off the streets before they grow to a bigger threat like the‘ve already become in many parts of this scary nation. Antifascists and antiracists in the far north: See everyone of you on saturday in NMS! 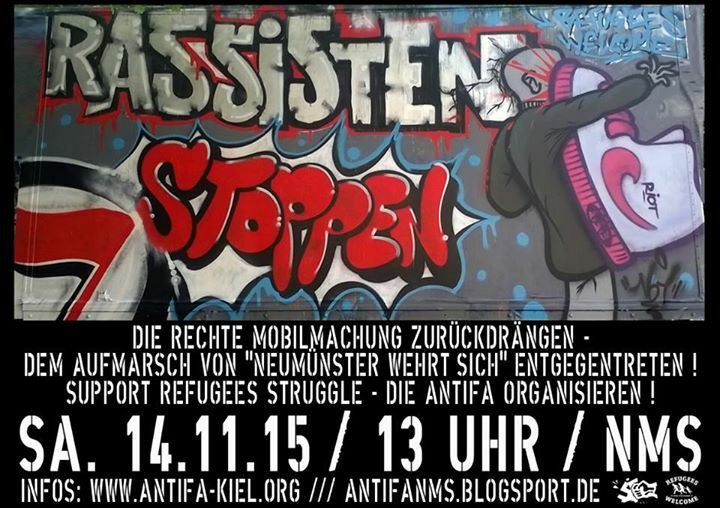 Organise yourselves & check info updates here www.antifa-kiel.org !